By now we’d assume that you’ve read our comprehensive launch report of the facelifted Honda CR-Z from yesterday. We were first to report the car’s surprise world debut at the Indonesian International Motor Show last September, and then covered its European premiere at the Paris Motor Show a week later. We’ve driven the facelifted car in Japan too, taking it out for a short spin around the Twin Ring Motegi Speedway in Tochigi. Closer to home, we’ve tested both the manual and CVT variants of the original CR-Z. It’s safe to say that we’ve covered the Honda CR-Z a fair bit, but we’re not done yet! Here comes an extensive interview with the new CR-Z’s Large Project Leader, Norio Tomobe we had the privilege to meet earlier this week. Read about everything you’ll ever want to know about the updated hybrid coupe – from its new lithium-ion battery to the possibility of a more powerful version. Yes, yum indeed. How does the new battery differ in terms of performance as compared to the old one? By quite a bit actually. Positively of course. Both voltage and power outputs are increased by 44% each. Effectively the battery performance alone is up to 1.5 times better, and the charging rate is 1.5 times faster too. And as the capacity is bigger, we can store more and output more as well. The new battery weighs the same as the old one, but has a slightly smaller size. It’s packaged in the same place as before, which is in the boot as to not alter the CR-Z’s perfect weight distribution or handling balance. 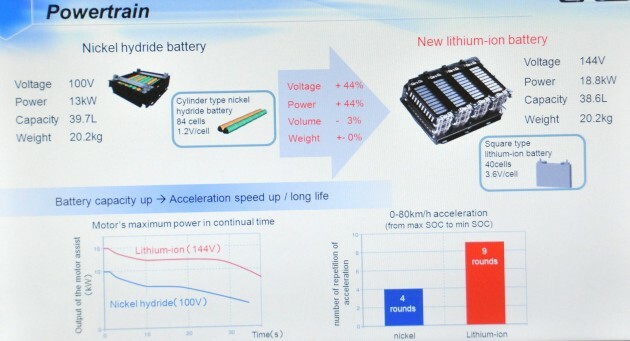 Does the use of a new battery improve fuel efficiency? Yes, of course. Over the Japanese-standard JC08 cycle, the new CR-Z uses 0.2 litre per 100 km less than before despite being quicker and more powerful. Has the suspension or anything else been changed to support the extra performance? Yes, the clutch in the manual gearbox has been beefed up to support the additional power. The CVT stays the same. We have revised the front stabiliser and dampers for better response. In Japan, we offer bigger 17-inch wheels so the changes are also done to support that option. Why does the manual variant get more horsepower than the CVT? With CVT, the engine growl is higher as it sticks to a higher rpm for prolonged periods. To solve this problem, we’ve used a different silencer on the CVT models which explains the slight difference in power between the two variants. What is the current demand split between the manual and CVT variants? 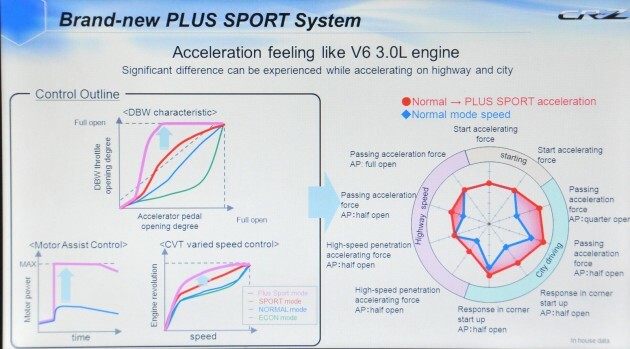 For Malaysia it’s 90% CVT and 10% manual, whereas in Japan and America, the model split is closer to 70-30 (%). Regarding the S+ button, was it something that the existing customers want, or was it a planned addition? I’m a BMW fan and in my Z4, I like the fact that it has a Sport + function on top of the standard Sport mode to offer a different driving feel. It was too late to implement it into the original CR-Z so for the facelift model, I personally suggested the implementation of an S+ mode. It’s basically just a software setting, where when the button is pressed, the electric motor pushes out 100% assist power and the throttle opens fully. Effectively it works like a boost button. Paired with the CVT, it will also trigger appropriate downshifts for maximum acceleration. As a performance benchmark, when you press the S+ button while travelling at 100 km/h, it will only take 7 seconds to reach 180 km/h. 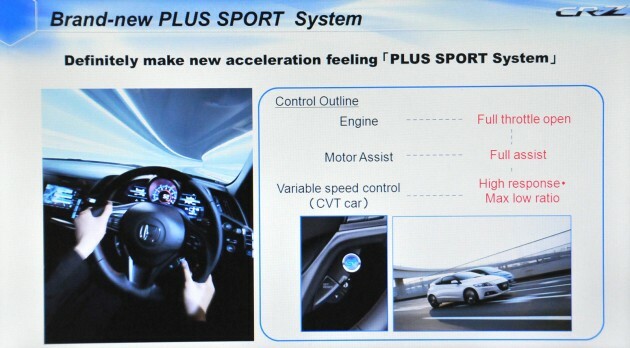 Since the S+ plus button is on the steering wheel and operates the engine performance, can it be dangerous if activated through tight corners? No, it’s perfectly safe. The electronics will sense the cornering and steering angle before activating the S+ mode. In a straight line or a smooth curve, it will provide the necessary performance kick. But if the steering is turned tightly and there’s a chance of losing traction should the boost be triggered, the system will be cut off. Regarding the exterior changes, is it purely cosmetics or are there any aerodynamic benefits? The mesh grille on the new car would actually affect the aerodynamics, but we’ve managed to monitor the situation so in the end, we changed the cosmetics without having any detrimental effects on the aerodynamics. A hybrid’s battery is always a big concern among consumers, even with the long and comprehensive warranty package that Honda Malaysia offers. How long can the CR-Z’s new lithium-ion battery last? As with all of our hybrid vehicles, the CR-Z was developed to adhere to all existing regulations globally, especially concerning the battery. At the moment, the strictest standard is the American Emission Warranty, which dictates that the battery must last for at least 15 years and 240,000 km. The CR-Z, new or old, passes that standard. There is no exact answer on precisely how long the battery can last, but we can commit that it adheres to the American Emission Warranty which again is set at 15 years and 240,000 km. So does that mean that if the battery happens to fail before 15 years and 240,000 km, it will be replaced under warranty? At the moment, Honda Malaysia is giving a battery warranty of five years with unlimited mileage – the same with all of our hybrid models. And this warranty is from Honda Malaysia, not a purchased warranty. Also rest assured that the battery passes the American regulation. 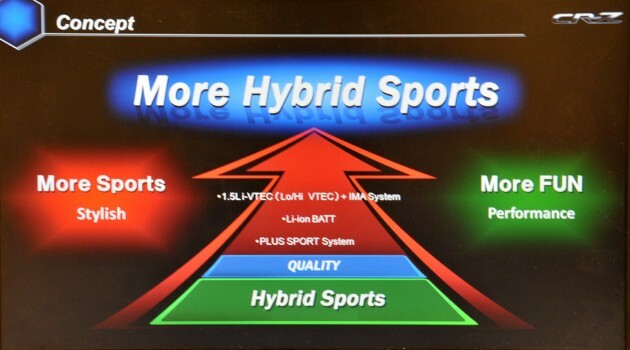 Our hybrid technology has been in development for quite a while already. We have done all sorts of toughness tests in the past years, and we are confident that the CR-Z will not face any problems with the battery. It’s known that a lithium-ion battery generates more heat in operation than the older nickel metal hydride item. How has this issue been handled? Yes, a Li-ion battery runs hotter than a NiMH power cell. To counter this effect, we have equipped an improved cooling system to the battery pack itself to control its operating temperature. There’s now a cooling fan next to the battery pack. The new CR-Z has four battery modules, each with 10 cells. There’s a temperature sensor placed on each module to monitor the heat, and the cooling system is very efficient to ensure that the battery modules stay within their optimum operating windows. We’ve done numerous tests on the new CR-Z, toughness tests, and we’ve never had the battery overheat (on which situation it would shut down and go to power save mode). Can the outgoing CR-Z be retrofitted with the new Li-ion battery? No, because the operating computer system and ECU are totally on different settings. To swap all the necessary components to allow the change would be very challenging and anyway it can’t be done at a Honda dealer, as there won’t be any supporting warranty for it. As the two models now have very different batteries, for how long will Honda stock up the replacement parts for the old model? Ten years after production stops. That’s a standard procedure at Honda across all production models, so in the old CR-Z’s case, it will be until 2022. With the recent floods, how well is the battery protected should it encounter such situations? Basically, if it is completely submerged under water then it will fail. It is water resistant in the sense that it’s protected to not let water filter through into the battery pack, but it’s not waterproof. It’s not like a G-Shock, it can’t work under water. If that happens, there’s a failsafe system that shuts down the battery to avoid electrocution. To reaffirm this, the battery is well protected. For example if you put wet items in the boot, the water will not affect the battery. It’s insulated against that. Also, all Honda hybrids are thoroughly tested by driving through 30 cm of water at a certain speed without being damaged. Feedback from current hybrid owners suggest that the cabin can get a bit warm when the engine shuts down automatically in heavy traffic. Has Honda found a fix for this? In terms of whether we’ve improved the situation compared to the old CR-Z, the answer is no. Only the latest Civic Hybrid has a different compressor to control the air con separately with the engine off. For the new CR-Z, Jazz Hybrid and Insight, the issue is handled by manipulating the idle stop operation, where as soon as it detects the cabin temperature rising, the engine will start automatically. For the hot Malaysian climate, the idle stop is set to start the engine sooner. As fast as it is, there will always be Honda enthusiasts who wish for something faster. Will there be a more powerful version of the CR-Z in the future, perhaps with a larger hybrid engine or even conventional petrol powerplant? There already is a faster version, and I was personally involved in the Mugen RZ project – that 300-unit limited run CR-Z that has 170 hp. But the basic concept of the CR-Z when I first developed it was to add a new value to the world, to the fans out there. The CR-Z excels in both fuel efficiency as well as performance. 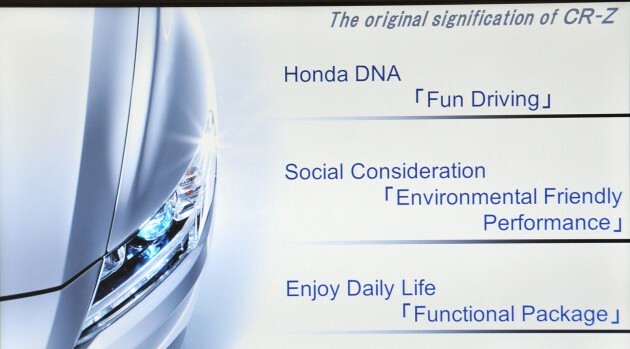 Honda as a company always promotes the sportiness of the product itself. Like what our president Takanobu Ito has mentioned, the NSX will be coming out soon. As you know, the NSX will cost you a bomb to buy, while the CR-Z is the attainable mass-market sports car for the public. But to answer whether there will be a more powerful version of the CR-Z, why, yes, you can expect that. The CR-Z has another 10 years left in its life cycle, so moving forward, it will always be improved until the next one appears. 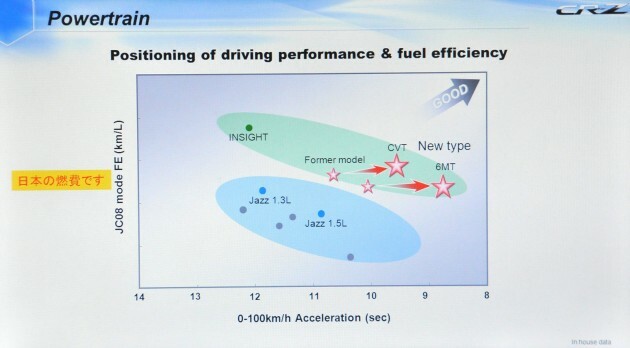 In Japan at the moment, there isn’t a significant demand for more performance, as fuel efficiency is still a priority. If there is enough demand for it, I would personally like to answer that demand. That’s so to say that it is not out of the question. The CR-Z has been designed as a hybrid, so there won’t be a pure petrol version of it. 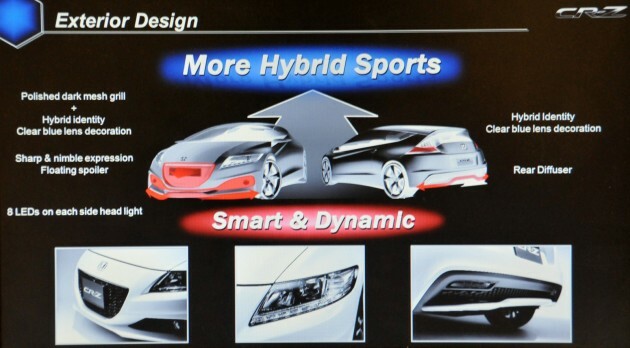 But, if I were to imagine a more sports-oriented version of the CR-Z, a hybrid and turbo combination would be ideal. A turbocharger works at its best beyond 2,000 rpm, while the hybrid system is more effective below that engine speed. If we can combine these two together, that would be the best combination to achieve optimum fuel efficiency as well as power. I like this statement, “A turbocharger works at its best beyond 2000 rpm, while the hybrid system is more effective below that engine speed. If we can combine these two together, that would be the best combination to achieve optimum fuel efficiency as well as power.”. Hope it comes soon! I have 1 question, “Why isn’t the facelift prettier?” But I will guess the answer is: “We’ve spent so much time on the spec that we don’t have enough time to lift the design to another level.” Hope next time you have more time for the exterior! The CRZ and the 86 is showing that the Japanese are trying to get back into the budget sports car they so succeeded in the 90s and early 00s. I hope there is some change in mentality in the Japanese car manufacturer as efficiency is not always the way to go. The 2012 Civic is actually a failed gamble by Honda, thinking in economic crisis hit America will begin to budget down and bu cheap cars. In a sense it worked as the Civic was the best selling car in it’s segment. But with criticism from all journalist including it’s once loyal Consumer Report, they have to rush off, put all project including the Jazz on hold and facelift the Civic. But he damage has been done, by than, there is the elegant Elantra, the high-tech Focus and the Cruze. The other thing that saddens me is that in all the CRZ, 10% is manual. Guess the Manual is really going in the way of the Jedi. will there be a 4 door version? sportier insight perhaps? 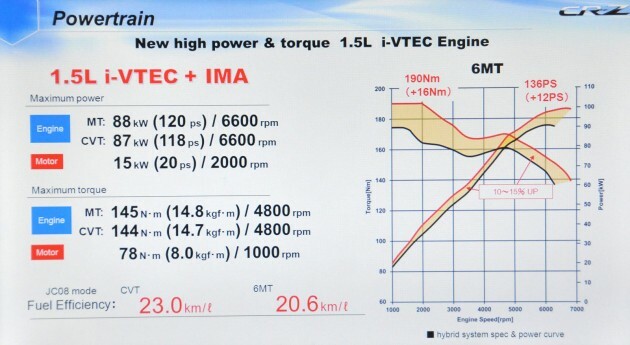 a diesel hybrid would be bttr….if honda could shoehorn its 1.6 idtec diesel wt this hybrid system…the current 1.6 idtec fc is at 80mpg & torque at 300nm…just imagine how it will further improve wt the hybrid system. Can you please help to ask him, Honda Thailand give 10 years battery warranty to Jazz Hybrid, can/when Honda Malaysia can do the same? 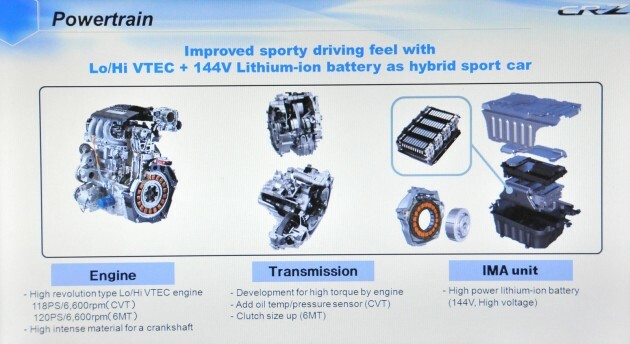 Battery can last for 15 years, but warranty by honda malaysia only 5 years. Idiots. Nobody concern whether the battery is recycleable or not. Will honda dispose it for us? Bring back to their land to dispose? So-called green tech, such an oxy-moron statement. Stop producing cars like this. for someone using greentech as his nickname. u probably lacking the time to read more on greentech.. Previous Post: Volkswagen XL1 production confirmed: 0.9 l/100 km!